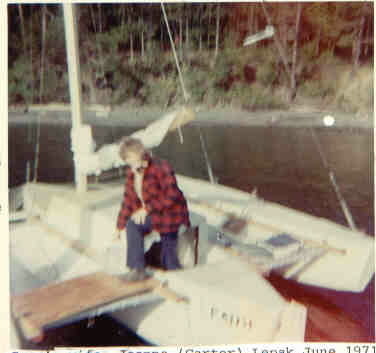 From what I know this small tri sailed from Seattle to the San Juan Islands in 1971. It was built by glass over 2lb styrofoam foam. Apparently after a while the bottom glass was scraped by going over rocks etc and the inside foam became sodden. This may be explained as the boat carried no dingy and thus the trimaran itself was beached in order to access the shore. If to build again then hardchine plywood epoxy conscruction would be preferable. What I like about this boat is that it is simple. It has optimised interior room over performance. No doubt the relatively beamy hull would not be fast. 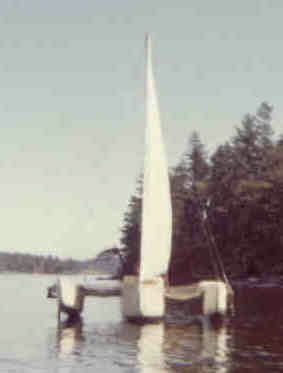 The hullshape would tend to over waves rather than through them. Notice the fins on the amas, which free up the center hull from a centerboard case. It has a high cabin which increases windage, however it does allow for a much more comfortable interior. As no heavy keel is required as in a mono and all the careful strengthening required to accept that large point load is not required, logic suggests that this would be an inexpensive boat to build for the size of cabin. It would be tempting to use a second hand Hobie 16 rig if one was available. In earlier times I had thoughts that the hulls of a Hobie 16 would be good as outriggers for such a boat. I now feel that this would be much more effort that it is worth and it would be best to build these out of plywood from the beginning. I have not chosen to show some of the more yacht like multis out there. These tend to be more expensive, heavier and more work to build. No doubt they would be superior boats but logic suggests they would cost more money and time to make. Names that come to mind are Farrier F22, Scarab 22, L7 trimaran, Thomas Firth Jones, Kurt Hughes 23ft tri. Below can be found some diagrams for what I feel are new lines based on the above images. Basically it is a copy of what is above. Overall concept is the same, minimal cost seaworthy craft that can carry 2 people sleeping side by side'. Construction in plywood as that would be easiest and cheapest. Bottom covered with a layer of fiberglass. 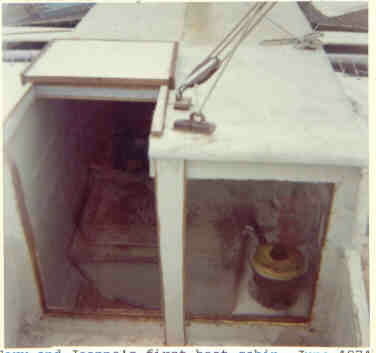 Not shown 2 or 3 bilge hardwood bilge strips to protect the bottom from damage on grounding. I have shown 3 configurations, overhead hinging mechanism with and without stays, and a sliding beam option. I think the sliding beam would be the best way to go, if only because that is what most others do. I think it best to think of something like this as a mere craft, as opposed to a refined yacht of some sort. It is merely a means to an end. Using a second hand rig from a beach cat. The overall beam is modest, speed will be slower than most mulithulls due to 'wide' 4ft main hull. The plus side is a comfortable spacious interior that is so hard to find on small multis.